This blog post is by MSU graduate student Michael Maiden. 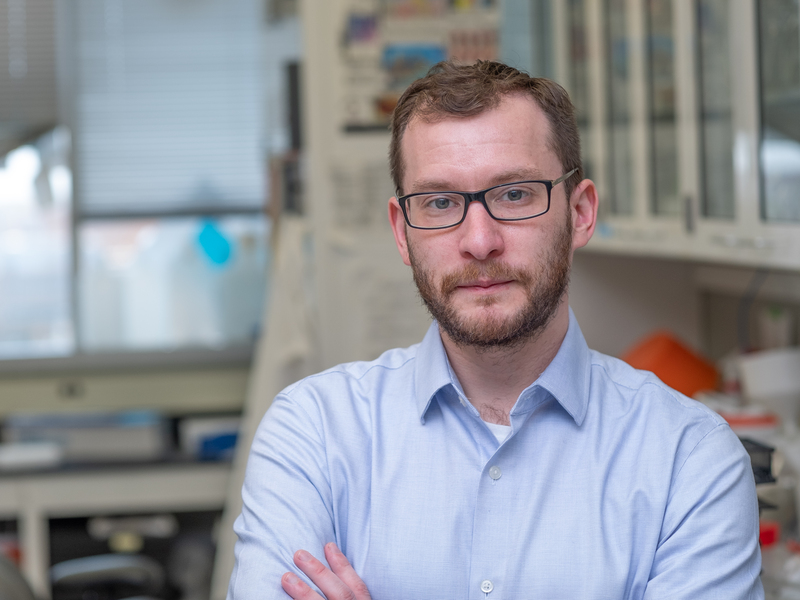 Currently, I am a 7th year DO-PhD student in the physician scientist training program in Dr. Christopher Water’s drug development and biofilm laboratory in the department of Microbiology & Molecular Genetics. I was attracted to the Michigan State University and the College of Osteopathic Medicine and, specifically the DO-PhD program, because it offered the opportunity to work on clinically relevant projects that may lead to better therapies for patients in the future. In the Waters’ lab my research is focused on developing new therapies for chronic infections caused by bacteria in the form of biofilms. Biofilms are a community of cells enmeshed in a self-made gel that renders the community up to 1,000x more resistant to antimicrobial therapies. For this reason, bacteria growing in biofilm communities are a major contributor to chronic infections and death. One bacterial pathogen, that often infects and forms biofilms in patients, is Pseudomonas aeruginosa. In fact, P. aeruginosa is the leading cause of death in patients with cystic fibrosis (CF). CF is a debilitating genetic disease that results in dry and clogged airways, which trap bacteria and leads to life-long chronic infections, resulting in premature death between the ages of 30 and 40 YO. 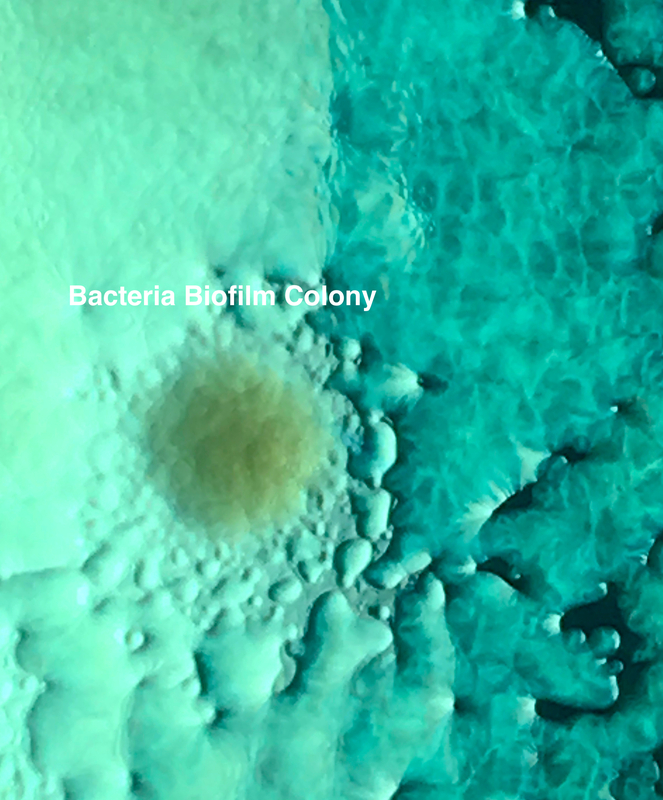 A biofilm colony formed by P. aeruginosa surrounded by a secreted self-made mucus that makes the bacteria very difficult to treat. By early adulthood, nearly 50% of CF patients are chronically infected with P. aeruginosa. To extend the lives of CF patients, it is essential to develop therapeutic interventions that eradicate P. aeruginosa before it is able to form a chronic infection in these patients. We found that by treating with two specific antimicrobials, tobramycin and triclosan, we could kill up to 99% of P. aeruginosa cells growing in biofilm communities. Further, this combination was effective in as-little-as 2-hrs. These exciting results raised one very difficult question, how? One way to determine how antimicrobials work is to go after well-known targets and pathways. By either turning them on or off, using various molecular techniques, you can test to see if your particular drug is working through that pathway. We tried this approach with little success. So, we turned to an un-biased evolutionary approach. Using this method, we took advantage of the natural tendency for bacteria to evolve resistance to any antimicrobial given enough time and small enough doses so that some bacteria may survive and thus mutate their genome. We evolved P. aeruginosa cells growing in a biofilm and rendered them resistant to the combination, by slowing raising the dose with time. Next, we performed whole-genome sequencing to identify the genetic mutation(s) that could help to explain how they became resistant. We found a novel mutation in P. aeruginosa renders the bacteria resistant to the combination. This mutation is located within an enzyme essential for protein synthesis. This gave us a valuable clue for how triclosan may be enhancing tobramycin activity, allowing us to formulate a model for how the two work synergistically. Subsequent experiments have supported this model. Further, the mutation we identified in our evolution mutants has been identified independently in clinical CF isolates of P. aeruginosa, which renders them resistant to tobramycin. Thus, our artificial evolution work in the lab has been validated by the natural evolution taking place in the clinics, specifically in the lungs of CF patients. We now have a possible lead for how our combination may be working synergistically against P. aeruginosa cells growing in biofilm communities. This new resistance mechanism could be targeted in the future to develop compounds that inhibit this resistance mechanism. Further, knowledge of this mechanism could pave the way for the future development of compounds that work in a similar fashion to our combination, thus, yielding much needed new antimicrobial therapies. Currently, we are exploring how this mechanism renders bacterial cells in a biofilm resistant to our combination. As antimicrobial resistance continues to be a major threat to human health, it is important to develop better strategies that more effectively use our current antimicrobial arsenal. This combination may by an example of one such strategy. As a future clinician, I am grateful to be a part of a project with strong clinical implications. And as a scientist, I have always been interested in how organisms evolve. The opportunity to perform evolution studies in the lab is both exciting and rewarding, providing little hints into what sustains life and what great trials and tribulations all living organisms have gone through to maintain it. This entry was posted in BEACON Researchers at Work. Bookmark the permalink.